What is the Giants' identity on offense? Eli thinks he's elite, now he's got a chance to prove it. We've had enough time to digest and discuss all that went wrong with the Giants in Week One against the Redskins, now we need to figure out how they move forward. Given the state of the defense, there isn't much that is up to the Giants. They aren't going to find a magic bullet for the secondary sitting around and looking for work at this point in the season. They will need to toss a coin in a fountain or cross their fingers or make some other gesture toward the fates and hope that Justin Tuck and Osi Umenyiora are back at full speed sooner rather than later. Teaming them with Jason Pierre-Paul will give the Giants a good enough pass rush to obscure other flaws and give them a fighting chance. There's more work to do on offense. It starts with figuring out what identity they want to have on offense because Sunday was a jumbled mess that simply won't work over the long haul. The choices are pretty clear and they both wind up coming down to how big a bet they want to make on Eli Manning. The first choice is to minimize his importance by making the team reliant on the running game. With Ahmad Bradshaw and Brandon Jacobs in the fold and the need to keep the defense as fresh as possible, there's plenty of reason to tilt in this direction. Running the ball didn't seem to be a priority in the opening week and the subpar job done by the offensive line would seem to be a big reason why the Giants abandoned the ground game fairly quickly. Some credit must go to the Redskins, but the Giants will see better defenses this season and trying to run the ball with no daylight is a recipe for disaster. The other choice is to do what they've done over the last few years and put more responsibility in Manning's hands. The Giants have had a pretty dynamic passing game in recent seasons and they clearly have a strong belief in Manning's ability to carry the team for long stretches. The drawbacks with this option start with the lack of targets available to Manning when compared to past seasons and continue back to an offensive line that did a shoddy job of protecting him down in Washington. Manning looked uncomfortable all day and going all in on him would be a risky bet to make given how little margin for error the Giants appear to have this season. That said, it is also the kind of bet you make on an a quarterback you believe in. Forget the kerfuffle over his comments about placing himself in Tom Brady's company, the Giants have long treated Manning like he's in that general class and now would be a strange time for them to stop. Things aren't as clearcut as throwing the ball all over the field or turning into some kind of prehistoric offense, even if they were just presented as such. The Giants need to do a little bit of everything to put points on the board, but the ultimate fate of the team will rest with the quarterback's play. Manning is the best player on the offense and that is the guy you lean on when times are tough. Those are the times the Giants find themselves in right now and they need Manning to lead them through to a better place. 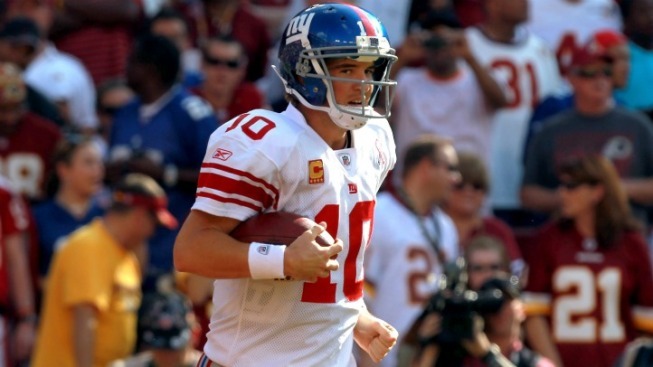 Manning is the Giants identity, however that manifests itself in the playcalling. Now it is time for him to assert it.